A German noble who joined the Order of Preachers (the Dominicans) at age 13, Henry was a loyal student of Meister Eckhardt. Eckhardt’s impact on him was powerful, influencing his life-long pursuit of Holy Wisdom (Sophia): ‘goddess of all beauty.’ A mystic that practiced extreme asceticism, Henry wore a tight-fitting undergarment as a nightshirt. This shirt was outfitted with 150 brass nails fitted facing into his skin. He was also inspired to carve Christ’s name into his chest. After 16 years, an angel appeared to him, asking that he end these severe practices. He listened. He was condemned for his powerful preaching and original thought, and spent years imprisoned in a dungeon. No longer able to teach, he focused on his writing. His themes focused on a mutual love between man and God. His best-known and loved work was, The Little Book of Eternal Wisdom. He taught that man should seek to be grounded in virtue and live a life of active service, balanced in deep contemplation. Looking inward, in Holy Wisdom, man would come to know this God of great love, cleave to him, and strengthened, pursue His work in the world. In this image, he is depicted with Christ’s name in Greek engraved on his chest. His robe is that of the Dominicans. His halo, the sign of his holiness, is symbolic of the flowering of Holy Wisdom, and within the nimbus are seven silver radiations, representing the seven biblical pillars of Holy Wisdom. 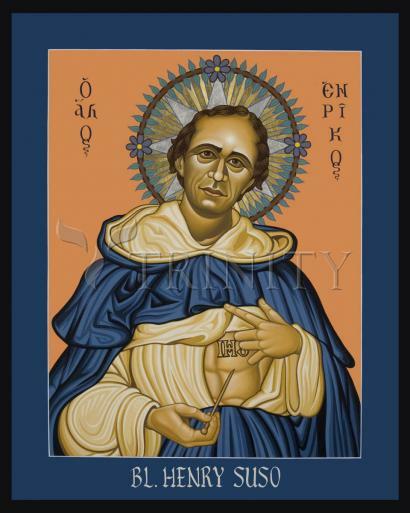 His feast day is March 2. The first writing from the pen of Suso was the "Büchlein der Wahrheit", which he issued while a student at Cologne. Its doctrine was unfavorably criticized in some circles—very probably on account of its author's close relations with Eckhart, who had just been called upon to explain or to reject certain propositions—but it was found to be entirely orthodox. Whereas in this book Suso speaks as a contemplative and to the intellect, in his next, "Das Büchlein der ewigen Weisheit", published early in 1328, he is eminently practical and speaks out of the fullness of his heart to "simple men who still have imperfections to be put off". Bihlmeyer accepts Denifle's judgment that it is the "most beautiful fruit of German mysticism", and places it next to the "Homilies" of St. Bernard, and the "Imitation of Christ" by Thomas a Kempis. In the second half of the fourteenth and in the fifteenth century there was no more widely read meditation book in the German language. In 1334 Suso translated this work into Latin, but in doing so added considerably to its contents, and made of it an almost entirely new book, to which he gave the name "Horologium Sapientiae". Even more elevating than the original, finished in language, rich in figure, rhythmic in movement, it became a favorite book in the cloisters at the close of the Middle Ages, not only in Germany, but also in the Netherlands, France, Italy, and England. After retiring to Ulm Suso wrote the story of his inner life ("Vita" or "Leben Seuses"), revised the "Büchlein der Wahrheit", and the "Büchlein der ewigen Weisheit", all of which, together with eleven of his letters (the " Briefbüchlein"), and a prologue, he formed into one book known as the "Exemplar Seuses". Suso is called by Wackernagel and others a "Minnesinger in prose and in the spiritual order." The mutual love of God and man which is his principal theme gives warmth and color to his style. He used the full and flexible Alamannian idiom with rare skill, and contributed much to the formation of good German prose, especially by giving new shades of meaning to words employed to describe inner sensations. His intellectual equipment was characteristic of the schoolmen of his age. In his doctrine there was never the least trace of an unorthodox tendency. For centuries he exercised an influence upon spiritual writers. Among his readers and admirers were Thomas a Kempis and Bl. Peter Canisius. Also called: Amandus, a name adopted in his writings. Declared Blessed: 1831 by Gregory XVI, who assigned his feast in the Dominican Order to 2 March.